The CSB currently operates 4 beamlines, encompassing 3 technologies: macromolecular crystallography (MX), hydroxyl radical-mediated protein footprinting (FP) and X-ray absorption spectroscopy (XAS). 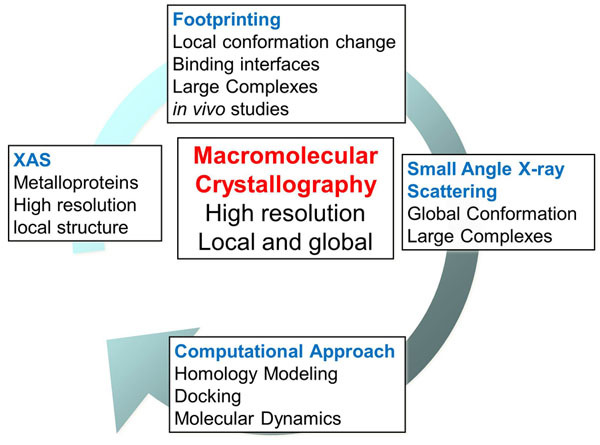 To facilitate the continuation of these programs, the CSB will be transferring the programs in protein footprinting from X28C-NSLS to XFP at NSLS-II, in X-ray absorption spectroscopy from X3B-NSLS to XAS at NSLS-II, and in macromolecular crystallography from X29/X3A to a partnership with FMX/AMX at NSLS-II. At the same time the NIH has also funded a SAXS beamline (LiX), which will be built alongside with FMX/AMX. The CSB will access LiX through the General User Program to carry out developmental and feasibility studies for users interested in SAXS data collection and analysis. Contact Wuxian Shi for details. It is advantageous that all NSLS-II beamlines dedicated to structural biology will be located together (near LOB-5) and will be part of the "Biology Village" at NSLS-II. The Biology Village is a group of scientists as NSLS, including the CSB, who have organized all strategic planning around life sciences beamlines and technologies of the NSLS-II. We are planning to leverage the co-localization of these resources and the community of scientists that will develop with the breadth of the CSB structural biology expertise to develop an Integrated Biophysics Program with concierge service and active recruitment functions for users interested in multi-technique approaches (MX, SAXS, FP and XAS) in structural analysis. We will provide service and support for users who request multi-technique approach (concierge service), as well as proactively communicate with users to utilize additional techniques that they may not be familiar with (active recruitment), to increase the productivity, visibility and impact of their scientific research. Several levels of service are envisioned, from simply providing guidance or assistance for users who intend to conduct all types of experiments themselves, to complete service, where CSB staff performs all data collection and analysis. CSB members have always been enthusiastic in promoting multi-technique approaches in structure determination (Figure 1). MX is the most popular and fundamental technique of all approaches providing high-resolution structure and both local and global structural details. FP and SAXS are in-solution techniques that are extremely complementary to each other and to MX. The combination of these methods is particularly useful in resolving large macromolecular complexes as MX can provide static high-resolution structural information, FP can provide structural information on local conformational dynamics at the binding interfaces, while SAXS can provide structural details on the overall global conformation of the full complex. SAXS is a well-accepted technique to study macromolecular complexes, especially when the structures of individual components are available but the whole complex is not. For multi-domain complexes, it provides information beyond Rg . such as domain-domain organizations. It is possible now that SAXS data yield a meaningful picture of the overall conformations, especially when large-scale domain rearrangements occur upon ligand binding. XAS is focused on metalloproteins; as 1/3 of all proteins are metalloproteins, this technique can be widely applied in resolving the high resolution structure at the metal binding site, including the electronic state of the metal center, often critical for understanding protein function. Figure 1: Multi-technique approaches in structural biology. In the next five years, the CSB is planning to establish an Integrated Biophysics Program with concierge service and active recruitment functions for the user community to provide support and complete service for those who are interested in utilizing these synchrotron-based structural biology tools: MX, SAXS, FP and XAS. The CSB will establish a website to promote multi-technique approaches Users who are interested in multi-technique approaches in structural biology will register at our website and establish a communication with a CSB scientist on how to proceed with the project. Several levels of service are envisioned, from simply providing guidance or assistance for users who intend to conduct all types of experiments themselves, to comprehensive service, where CSB staff performs all data collection and analysis. Some studies may be able to proceed at the alternative beamlines during the transition period.